Want to experience the Invisible Light? Get your copy, HERE. It began when I was a little girl singing and dancing on the streets of New York… I’ve always been a creative person. While my schoolmates were all trying to figure themselves out, I already knew pretty clear that I was an artist and meant to be making art. I love to paint, cook, make music, sculpt, and of course photography. How have you been moved, or changed by Art? Without art, I wouldn’t have the identity I have now, I wouldn’t have been able to throw my bevy of emotions into something and would probably have turned out a tornado of a person, and I also probably wouldn’t have struggled in the world the way an artist comes to experience. Art can be like the best and worst lover all in one, giving you access to so much expression and at the same time can leave you stranded and feeling like you don’t matter. I can confuse making art with public opinion sometimes. When the need for validation leaks into my creative process, I get distracted. I always have to come back to this one place where creating is about me within my process and nothing else matters, that’s where one truly gets lost enough to where something fantastic can be found. 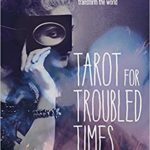 What was your first interaction with Tarot? I was introduced to tarot by a deck of cards and books that my mom passed along to me from her younger days. It wasn’t something that she was necessarily into, but she was compelled to pass them along and I would do card readings for myself throughout the years. When I would feel lost about something, I would do a card reading and trust that whatever message was coming through was something I needed to hear. How has Tarot influenced your view of art and the creative process? I’ve mostly familiarized myself with the Rider-Waite deck illustrations and love the idea of visual symbolism. I think that both tarot and my art embrace duality, the lightness and shadow of being. How did the Invisible Light Tarot begin? This is the weird thing, I have o idea… I really believe that it began subconsciously from an intuitive space, which seems appropriate. Somewhere the idea began to formulate and without thinking I started to match my photographic images with the meanings and visuals from the tarot. From there I just kept going. It was meant to be more of a functional and different way of sharing my photography, however it really took shape as an authentic tarot deck. What is different about the Invisible Light Tarot from other decks on the market? I haven’t seen too many photographic tarot decks, so it seemed like a unique idea to pair the two. What sets mine apart really comes down to the imagery. The photographs are really vibrant and timeless, shot with rare and expired film stocks. A lot of time and travelling went into making these images, so there’s a lot of energy in these cards. The book that was written by myself and my friend, Sarah Harron which comes with the deck was also really thought out. We spent many hours reading, discussing and writing to come up with words that really carry the essence of what these meanings are about. Can you talk a bit about the soul of the deck? I always feel like every deck has a personal story, and spirit that permeates every image. Like I was saying about what went into making these images. These photographs are each pieces of art that I’ve invested myself into. There’s a sincerity, a commitment, a lot of living that’s gone into the creating of these images. Making art is something that allows me space to reconcile that which is trying to be understood and felt, there’s so much feeling that goes into what I do. 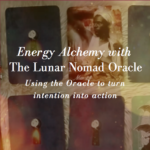 How has your creative process changed since creating the Invisible Light Tarot? I think I’ve been shooting images that are more up close and personal lately, but the magic that went into the Invisible Light tarot images is still there, it’s just evolving itself into another style. My favorite way I like working with the deck is a simple three-card spread I like to call “The Conversation Spread”. I ask people to knock the deck with their dominant hand to get the old energies out and their energy in, then pick three cards. One to get the conversation started, the second to elaborate and the third card is where the conversation leaves off. Where can people find out more about you, and your work? Thank you so much for being here… And sharing your creative spirit with us. Xoxo.